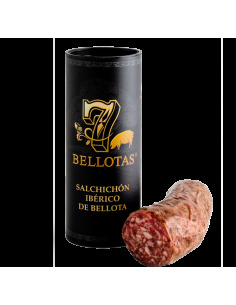 7 Bellotas® "Gran Reserva" BELLOTA Sliced by Machine 1X80gr. JAMON 7 Bellotas® Hand Cut 7 Bellotas® acorn-fed Ibérico ham "Gran Reserva" (jamón ibérico de bellota) hand cut by our award winner Maestro Cortador. Jamón ibérico de bellota "Gran Reserva" 48 Months cured. No Artificial Colourings, No Gluten, No Lactose 100% Natural JAMON 7 Bellotas® comes from a Pure Bred IBÉRICO Pig feed on acorns. 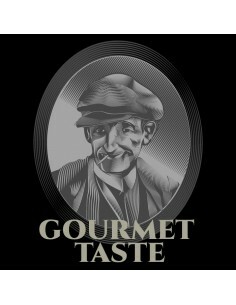 7 Bellotas® "Gran Reserva" Hand Cut Ham 1X80gr. Acorn-Fed Iberian dry cured loin (Lomo ibérico de bellota) Acorn-Fed Iberian Loin "Gran Reserva" (Lomo ibérico de bellota) comes from a selection of pure bred iberian pigs feeds on acorns. Store between 0° and 5° Unpack 10-15 minutes before serving. 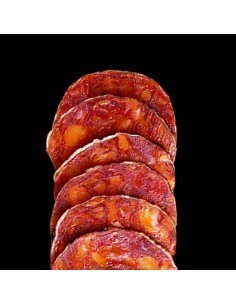 Serve at a temperature between 18 º C and 24 º C.
Acorn-fed Iberian Dry Loin "Lomo Bellota" 1X80gr. Acorn-Fed Iberian SHOULDER Ham "Gran Reserva" 1X80gr. IBERICO Shoulder Ham "Pata Negra" 1X80gr.